Industrial and systems engineering student shares a love for Binghamton that’s bright enough to part the clouds. Lauren Kelemen will receive her bachelor's degree in industrial and systems engineering on Saturday, May 19, 2018. When Lauren Kelemen was a senior in high school, she knew she wanted to go to college outside of New York state – anywhere would do, as long as it wasn’t in New York. She had been so sure of what she wanted… until she made a visit to Binghamton University. “I’m from Hopewell Junction which is near Poughkeepsie. My mother and grandmother told me, ‘You’re going to apply to at least one SUNY school, you don’t get a say in the matter,’ so I decided to apply to Binghamton. They dragged me to campus on a really gray, cloudy day and I was just miserable. I was convinced nothing could change my mind,” said Kelemen. When I walked out of the admissions building, the clouds had cleared and the sun was shining! That’s when I knew Binghamton was it for me. Then, she walked into the Binghamton University admissions building. Kelemen now tells this same story to the prospective students that she meets as a campus tour guide, a position she’s held since she was a sophomore. Spend a few minutes with Kelemen and it’s easy to understand why. She’s effervescent and approachable but also the type of person to probably approach you first. 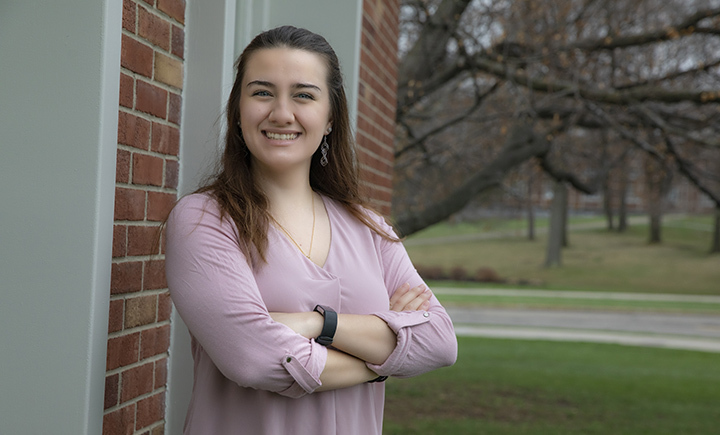 Like all engineering freshman in the Watson School, Kelemen was enrolled in the Engineering and Design Division to help her decide which engineering field would be her major. “Originally, when I was growing up, I didn’t know much about industrial engineering. I was more raised to be interested in mechanical engineering, but I did not like physics. For whatever reason, the theory was fine but applied physics just never clicked,” she said. Since declaring her major, Kelemen has been heavily involved in the Binghamton University chapter of the Institute of Industrial and Systems Engineers (IISE) and will be attending the IISE Annual Conference as well as competing as a finalist in the IISE/Rockwell Undergraduate Student Simulation Competition in May. She might not be the first person you think of when picturing an industrial and system engineering major, but she said she’s used to breaking those boundaries. “People tend to ask me what it’s like being a woman in engineering, but I played the trombone in high school so I’m already used to being around guys more. It’s fairly easy for me,” she explained. If you had asked me back in March, I would have been anxious like other graduating seniors, but this week has actually been really great. I recently accepted an offer to work at Disney. It’s a dream job for me! Now that graduation is just around the corner, Kelemen is working on what will happen next. Kelemen will be an associate systems engineer for Disney at the New York City location. No matter where things take her though, she’ll be sure to share what she loves about Binghamton University with everyone she meets.